Skoda's Vision C concept car, pictured in Geneva, previews a more dynamic styling for the brand. 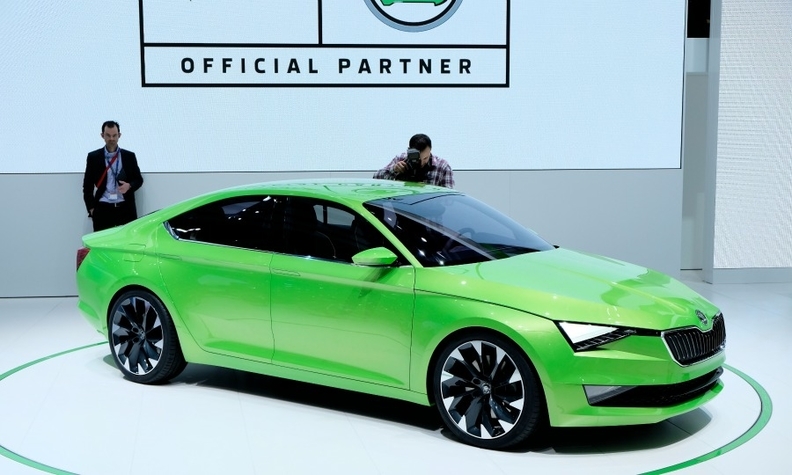 GENEVA (Reuters) -- Volkswagen Group is striking out in a new direction to boost the image and appeal of its Skoda and Seat brands, moving Skoda more upmarket while refocusing Seat on Europe after a failed China export strategy. Czech-based Skoda is trailing ambitious sales targets and Spanish carmaker Seat is battling a decade of losses. The European auto slump caused Skoda deliveries to fall 2 percent last year to 921,000, well short of a 2018 goal of 1.5 million. Sales at Seat were up 11 percent at 355,000, but underutilized capacity served to extend its long run of losses. By contrast, French carmaker Renault's budget models helped it to defy a weak Europe and score significant gains in emerging markets, with a particularly strong showing from its no-frills Dacia brand. Previously positioned as VW's budget alternative for eastern Europe and Asia, Skoda will target more affluent buyers in future, its CEO, Winfried Vahland, said at the Geneva auto show. Skoda unveiled its elegant Vision C concept car in Geneva, its first coupe alluding to a more dynamic styling of future vehicles - the five-door model has enclosed door handles and triangular headlamps. "We never before expressed passion in our products," Vahland said. "It's like the brand is growing up." Similarly, Seat is countering its image as the eternal money loser of the VW group by offering more variants of its Leon model and sharpening its focus on rebounding European markets. Though reducing non-production staff and administration, it's unclear when the Spanish business will return to profit, CEO Juergen Stackmann said at the show. Seat has amassed 1.5 billion euros ($2.06 billion) of losses since 2005. The brand is now reaching beyond its traditional base of young city dwellers, targeting families and fleet operators with the Leon ST, its first compact station wagon. The model has attracted 20,000 orders within weeks, Stackmann said. 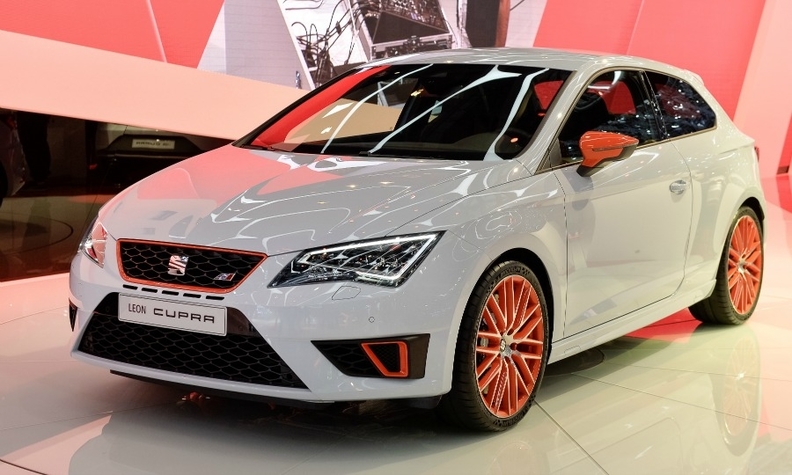 Seat is adding models like the Leon Cupra, pictured in Geneva, to its popular compact range. Without a turnaround in mass markets for VW, Europe's No.1 automotive group could struggle to surpass Toyota as the world's biggest carmaker by 2018. In the nearer term, failure to get to grips with the lower-cost brands is likely to weigh on its share price. "VW needs a compelling presence in volume segments and emerging markets if they're serious about clinching the top spot and retaining it," said Stefan Bratzel, head of the Centre of Automotive Management think-tank near Cologne. Regardless of whether it surpasses Toyota, VW must succeed in lower-cost categories to remain a force in a volume segment that brings the economies of scale required to meet its profit goals. Skoda and Seat accounted for 13 percent of VW's 9.7 million record sales last year. VW rejected suggestions that the change of tack may renew past friction between Skoda and Seat and with the core VW division. The VW group has 12 brands and about 300 distinct models. In 2009 the Skoda Superb trumped the more expensive VW Passat in quality surveys and offered features that were priced as extras in the Passat. The upscale shift ruffled feathers at VW, resulting in the departure of Skoda's then-CEO. "Why should Skoda build only practical cars," VW Chief Executive Martin Winterkorn told Reuters. "However, we must ensure precise distinctions are made between the brands, that the brands interact well and that everyone finds their corner." Forecasters, however, remain skeptical that VW's shake-up will have the desired effect. "VW has such a spread of the [volume] market with the likes of Skoda and the VW brand. Seat doesn't fit right with that portfolio," said Jonathon Poskitt, head of European forecasting for specialist analyst LMC Automotive. Seat deliveries could rise 30 percent to 462,000 cars by 2018, research firm IHS Automotive estimates, still short of Stackmann's goal of 500,000. Sales at Skoda, meanwhile, could grow by 26 percent to 1.16 million vehicles, the forecaster says, against a target of 1.5 million. "I view myself as a member of a relay team taking part in a marathon run," Stackmann said. "It's a tough business." Stackmann said Seat is considering building cars in China. Plans by his predecessor to expand to China from Seat's base in Martorell near Barcelona failed because of high import duties and distribution problems, Stackmann said. Seat sold a dismal 1,100 cars in the world's biggest market in its first full year there in 2013.